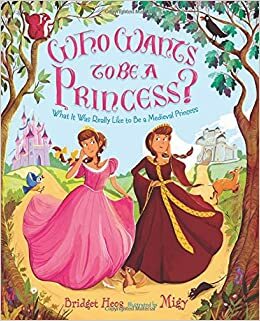 Summary: For those dreaming about Disney life, this book provides a bit of a wake-up call as to what life for a princess was really like. The author explains in her note that the “real” princess shown here is based on what life was like circa 1100-1300 in Great Britain. Each two-page spread contrasts a fantasy princess with a real one. Pink and purple castle? Nope, it would have been drab stone surrounded by a moat stinking of sewage. Beautiful gown? Itchy brown wool was more like it There might have been a handsome prince to marry…at around the age of 12, and that marriage would have been arranged. The final page shows the princess falling asleep and dreaming of being “you”, the modern reader. Includes an author’s note and a bibliography. 32 pages; ages 4-8. Pros: A clever way to teach a bit of history, using a concept that’s sure to catch the eye of certain readers. The illustrations are kind of Disney-esque, which will add to the appeal. There’s also a nicely subtle message about being happy with who you are. If you’re struggling to loose your little cherub from her “Elsa” costume, this, just might do the trick. Cons: It’s a pretty cursory look; those wanting much information will have to look elsewhere.